Ability to make video calls using either WiFi or 3G (additional cost may apply) network and the quality will depend on its network bandwidth. Call friends across town or on the other side of the world and talk for as long as you like with free Skype-to-Skype voice calls. Ability to make a calls and messages while send an alert from Microsoft’s servers to Windows Phones. Comes with “live tile” that shows how many messages you have, and who they’re from. Double tapping on the screen will zoom in the picture up to full screen and repeat the step again will toggle it back to normal view. Able to update your mood message and share what’s going on in your life. New messages will appear as alerts at the top of the devices screen. During Skype call, it looks just like a phone call, except that accepting it opens the Skype app. Easily search for friends on Skype and add them to your contact list. Ability to make free video calls to most of the Internet. Brighten up your instant messages with fun emoticons and show people exactly how you’re feeling. “Skype for Windows Phone 8 isn’t just about the design – we’ve built a completely new app from the ground up to be an important part of the Windows Phone experience,” says Skype on the company’s blog. The new Skype app is compatible with Windows Phone 7.5 and above. 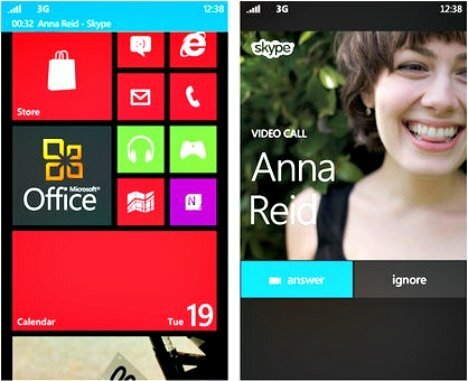 Are you looking ready to use Skype like you’ve never done before on your upcoming Windows Phone 8 device? Share your impressions in the comments.